I slept much better at home, before coming to college. Please help me, so I am not so grumpy in the morning. Your question reminds all of us about dorm life. However, there are some real health and well-being issues, that should not be ignored. While no college student will admit missing their parents, there are other reasons causing poor sleep. This is a problem found in all college dorms. Getting good sleep in college is not always easy. First, your routine is irregular. 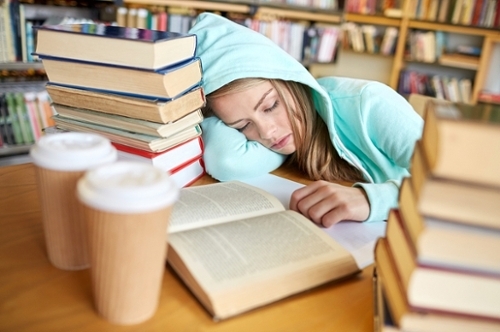 Classes often start at different times each day, studying can keep you up late, and weekends are chaotic. These are partially under your control. Other wildcards include sharing a room for the first time. Your roommate keeps odd hours. Neighbors listen to truly awful and loud music. Dorm beds are not hotel-quality comfort either. You can take control. First, make your bed a place you actually enjoy. More than style, quality cotton sheets and comforter are starters. Your aged, dorm mattress needs to be enhanced. The average U.S. mattress lasts 7 years. However, there are no published stats on the lifespan of a college mattress. Safeguard your own heath with an inexpensive mattress topper, cautions a leading featherbed manufacturer. These steps make a huge difference in getting good sleep. Research also confirms that light is a key factor in sleep. Families living on farms, not cities, have a more sleep-friendly environment. Light darkens at night and begins to brighten shortly before you awake. This tells your brain it is time to start waking up. It's easy to darken a room, but you want natural light in the morning. Another strategy is to create a bedtime routine. Doing this also requires you to put away both your phone and laptop. You need to signal your brain there is a separation between daytime stress and bedtime. Awakening at night, even for an email or call, disturbs the brain’s sleep cycle. You may find yourself not well rested in the morning.